Hello. I am Katie Jenkins, the founder and creator of Dog Hair Day. We are thrilled to have our bespoke collection of dog shampoos included in Naturewatch Foundation's Compassionate Shopping Guide. Let me tell you a little of how Dog Hair Day came into being. A lifelong animal lover, I was lucky enough to own and run my own pet supplies business in the city of Lancaster for five years. During that time I became fascinated with the ingredients listed on the labels of the many pet-related products out there – and I spent a lot of time deciphering what these labels actually revealed. It became clear that while a lot of products may be labelled and marketed as ‘organic’ or ‘natural’ they can sometimes include potentially harmful ingredients. Because my husband and I care about what goes into our dog, George, (i.e., what we feed him) and what goes on him, this became something of a bugbear of mine. In particular, some of the ingredients in certain grooming products unsettled us. It dawned on us that we could devise our own products. Our aim was to design a product that doesn’t contain harsh chemical ingredients, that is gentle, effective and ethically produced and available at an affordable price. Closing the shop to concentrate on this new project was a difficult decision as it meant saying goodbye to friends made over the years, both human and animal, but it felt right. We thoroughly researched ingredients, chose high quality ones and omitted potentially harmful ones. 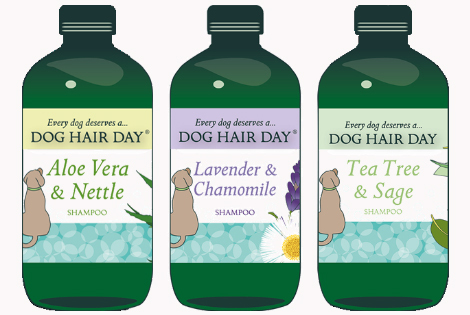 A total of 97% of Dog Hair Day shampoos’ ingredients are naturally derived and the shampoos are at a pH suitable for a dog’s skin. We insist that none of our products or raw materials ever have been or ever will be tested on animals. It took a lot of (non-animal) testing and developing of prototypes and now we have a small but very lovely range: Tea Tree and Sage; Lavender and Chamomile; Aloe Vera and Nettle, with a fourth planned for 2018. George has become the face of the brand as well. Another thing that is really important is that customers should be able to see exactly what goes into Dog Hair Day. That’s why we provide full transparency with a list of all our ingredients on our labels with detailed explanations on the website. This attention to detail has paid off because not only do our customers and their dogs love the shampoos but they can be sure that Dog Hair Day dog shampoo is cruelty free. We are delighted that Naturewatch Foundation have endorsed our products. We can demonstrate that we adhere to a fixed cut-off date policy and proactively monitor our suppliers to ensure that our products will continue to adhere to the Naturewatch Foundation criteria. Our supplier monitoring system is also open to independent audit. We proudly display all this on our website. We also think that it is a brilliant idea that the Naturewatch Foundation is giving away copies to those who are new to cruelty-free shopping. We say that every dog deserves Dog Hair Day - not just George!